Samboja opened last year as part of a conservation project operated by the Borneo Orangutan Survival Foundation. The project has helped restore over 2,000 hectares of wasteland and after planting 1,800 species of trees, wildlife has returned. It is now home to up to 200 rescued orangutans, over 50 sunbears and you can also see rare pink river dolphins. Accommodation is in standard or treetop suites and helping out is encouraged, from planting trees to feeding animals. 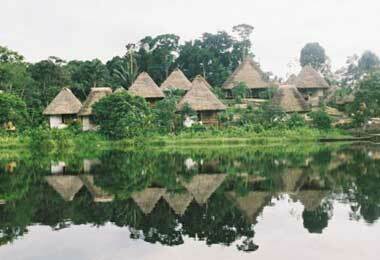 Napo Wildlife Centre in Yasuni National Park was the winner of the First Choice Responsible Tourism Award in 2006. The centre is jointly owned by a team of biologists and the local Anangu people, who put their share of profits into education and healthcare. Built deep in the Amazon basin, there are just 10 cabins with solar power. It offers an abundance of wildlife, including more than 10 types of monkey, as well as caiman, puma, sloth, jacamar, hoatzin and other unusual animals. Parrot watching is popular from the clay hide and there’s a tower with views of the Andes. The Isla di Espiritu Santo, a two-hour boat ride from the southern end of the Baja California peninsula, is a natural reserve. Baja Camp’s five tents on a gorgeous stretch of beach are the only sign of human life, but the area is so rich in marine life that Jacques Cousteau called it “the world’s aquarium”. The Sea of Cortez is reputedly home to a third of the world’s whale and dolphin species, which can be spotted from the tents, boats or kayaks. You can snorkel with sea lions and dive with manta rays, turtles and, in season, hammerhead and whale sharks. The Italian chef and host Andrea dives for your dinner, serving seafood feasts on tables next to the water. Sausage Tree Camp in the Lower Zambezi National Park has six luxury Bedouin-style canvas tents overlooking the Zambezi River complete with open-air bathrooms and a personal butler. But the real draw, described as “all the game and none of the people”, is that, with no fences, you’re more likely to wake to see an elephant wandering through camp than a guest. Out on safari – half by boat, half by 4×4 – you’ll see everything from lion, leopard and hippo to zebra, bush buck and honey badger. Despite its seclusion, Los Castaños is easily accessible: 90 minutes’ drive from Malaga, and 15 minutes from Ronda. Set up in tree-covered mountains in the white village of Cartajima, birdwatching is a speciality. The Alto Genal valley is an important breeding area and migrating birds pass through; four different species of eagle can be seen circling overhead. Research biologist Peter Jones, the local bird expert, can take guests on guided walks. The hotel has a stunning rooftop terrace and plunge pool, where lovely hosts Di and Denny serve delicious food. This entry was posted on Saturday, February 17th, 2007 at 12:14 pm	and is filed under Advice and Guide, Interesting Stuff, Wonderful Things. You can leave a response, or trackback from your own site.